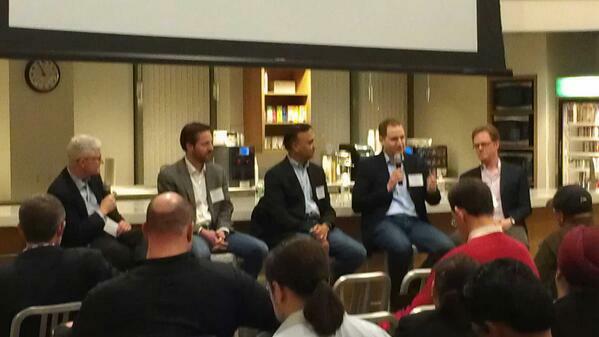 During the week of March 24-28, 2014, Cognizeus arranged for Boston’s first weeklong data and analytics unconference. Each day held a different track starting with Monday and Big Data Analytics, followed by Tuesday with Health Informatics, Wednesday with Finance/Insurance, Marketing on Thursday followed by Workforce Analytics on Friday evening. The keynote speakers for each day started with Paul Sonderegger from Oracle, Gil Alterovitz at Harvard med school, Christopher Lynch at Atlas Ventures, Judah Phillips at Smart Current, and finally Greta Roberts from Talent Analytics. Klurig Analytics was a Silver sponsor of the event with our team responsible for social media and social media analytics. Using the handle @AnalyticsWeek and tweeting both text and images to the community, enabling non-attendees to follow along as well as leaving a historical trail of the event. For instance KDnugget used our tweets for a great post about Monday night where Gregory Piatetsky moderated a panel. Gregory Piatetsky: Data scientist will be replaced by automated algorithms? Data science in a box? Can data science be automated? David Jegen: Humans do what humans do really well. Machines do what they do really well. There will be a coexistence. PayPal had problems and put machines on it, realized that you need humans and now they coexists. Machines to curate data. When do you bring in a human to curate, to train the machine. Humans are artists. Anand Rao. In AI, we have proven that it is really hard to replace a human brain. Chip Hazard The data preprocessing part will be handled by machine. The key is to ask the right question, the right question is really hard to find and that is where we need a human. Paul Markovitz: data scientist will be doing less grudge work (machines handles that), instead they will be doing the fun work. The panel discussion was moderated by Charlie Schick and consisted of Michael Greeley, Allen Kamer, Kris Joshi and Timothy Andrews. Charlie Schick: Even though there are hackfests in healthcare programming, but it is too slow. How do we overcome the slow speed? How do we get all together so providers have access to data and systems. Michael Greely: Many great initiatives and accelerators but they are not adequate yet. Optum Labs is better to teach ecosystem. Optum Labs is great place to learn the ecosystem of healthcare as for analytics and bigdata. Allen Kamer: We struck partnerships with different groups to partner to help us build products, early adopters such that we can prove. Partnerships are a great way of building products. Helps patients getting help faster and more cost effective. Optum Labs is helping smaller companies to get started. Companies can reach out to Optum Labs with different initiatives to partner around things. Kris Joshi: The innovation is very local. The flipside is different from other places in the country. It is important to partner. Need to get the right asset built and then a different way of scaling the asset. Tim Andrews: Healthcare is very regulated. There is no one institution in charge of healthcare. It is very hard to get them to share. Need to get hold of multiple targets to work together, but it is really tough in healthcare. Realtime is old. Intime is more important, as ‘in time’ to make a decision. Time to value! Bill Fearnley: What is the key challenge that lead to big data solutions? John Raguin: Marketing data analytics have been around for decades. But tools doesn’t mean anything. The real question is: will this customer be a profitable customer for me? Technology is immaterial as long as it gets the job done. Deborah Cooper: Without big data, my group would not be as responsible as they should be. Big data is key. The challenge is too many data non-integrated data sources, and too expensive. Michael Schmidt: Important to be able to explain what goes into a prediction. His team created a bracket for March Madness. 75% accuracy with minimal effort. Easy to explain, easy to use. When is the right time to quantify? When you have the data, need information about the data, consistency. Right time when the company is cross-functional, when you can improve a situation and when revenue is at risk. All data is not actionable. Analytics value chain: 1. understanding, 2. collecting data, 3. reporting, 4. analyze and socialize, 5. optimize – 6. demonstrating that the analytics team provide economic value, that the analytics have an economic impact on the bottom line. What does a complete analytics team include? you need the architecture team, the reporting team and the analysis team. Cesar Brea: what is the undefined problem that you are trying to crack? Raj Aggarwal: Instead of building apps, Localytics built tools for manage apps. Sell shovels instead of digging for gold. Ben Clark: Radical about keeping it simple stupid. Prefers A/B testing to MVT (multivariate testing). Business value can be evaluated with simple metrics; traffic, conversion rate and average value. Almost all marketing analytics use the same three data points. Insight comes from many data sources. Need to additional value. Torture data until it confesses. The important thing is how we mix the data, how it is pulled together. Tracking to outcomes matters immensely in data science. New Deloitte report – HR analytcs is in the top 5 global trends – HR Analytics is huge and it will grow! If employees are leaving prior to reaching breakeven, they are a loss for the company. The key is to use workforce analytics to help predict which employees will stay past the break even point. When you make decisions, you need to use both the analytics and the human intuition. HR analytics helps to put people in the roles where they want to be. Abby Cashman led the panel as a moderator and among other great question, Abby asked the panel the following question: how do you define ROI, how do you measure this, what are the metrics that you use? David Parker: We need to keep clean: red, yellow, green – we know what color the banker. Started at 6% green, now 24% green – good trend. Coach to behavior based on metrics. Melissa Arronte: Measure by customer satisfaction surveys – do you use the data that we provide? A few successes in analytics will pay for the team. Previous Digital Marketing Files: Are Marketers Forgetting to Talk Today?